Friday May 12th, 2017, saw a very well attended meeting of NJIPMS at our usual Nights of Columbus location. There was no set theme for the evening, so an eclectic mix of ships, aircraft, sci-fi, figures, and lots of in-progress builds, filled the tables. The next meeting is set for June 9th, same time and place. The theme will be “The Pacific: 1942”, so dig out your best and bring it along. The first meeting of 2017 was held on a Friday the 13th, but any superstitions did nothing to keep away the members. We had one of the best turnouts in recent memory, with lots of new kits on display, and many participants in the “Out of the Box” contest. Mike Terre and Marc Rocca took top honors in the contest, with their Harriet Lane and MIG-31 builds. Another great turnout for Sci-Fi night this year. Everything from old kits to new kits to scratch-builds filled the table. The food and open bar were a big hit, as usual (attendance was very high!). The club meeting covered various items, including information on who will attend the upcoming Region 2 and MarauderCon shows this fall (information on both on the Upcoming Events page). The August meeting was held on Friday the 12th, with a good attendance. 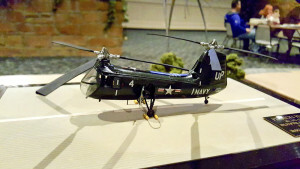 The contest was Civilian Night, and Dan Spera took the honors with his Roden Mohawk in 1/48th scale. 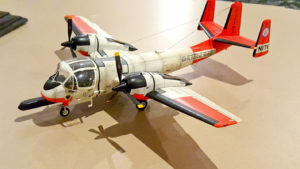 The IPMS Region 2 show in Virginia Beach and MarauderCon were both discussed, as was various other club business. We’re meeting next month for Sci-Fi night, and dinner will be served! As mentioned in last month’s newsletter and at last month’s meeting, the June meeting will be held a week early, this Friday, June the 3rd. I’m traveling these past two weeks, so the newsletter will be going out late tomorrow, Tuesday, evening. The meeting of March 11th, 2016 brought Nostalgia Night, hosted by Mike Terre and Dan Spera. 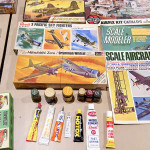 Lots of old school kits and tools and paints were out on the tables. Several members also spoke of what they’d brought, be it the first kit they ever built, a gift from someone, or how a particular kit brought back specific memories. MosquitoCon 25 business was discussed. Everything is on track for the show. See everyone on April 2nd! The first meeting of 2016 is in the books. Due to a delay in the Phantom group build completion, and likely post-holiday recovery, there was a light turnout on the contest table. Several Phantoms in progress did make a showing, however. John finished up his tree making tutorial, and many things MosquitoCon were discussed. Next month’s meeting is on Friday the 12th of February. Have those Phantoms completed, and Big Bill will be giving a tutorial on quick and dirty LED lighting for models. The New Jersey IPMS 2015 year came to a close on December 12th, with the annual party. Good food and good company were in abundance, as well as a great selection of the first-place winners from this year’s modeling contests. We start of January with the F-4 Phantom group build completion, so if you took a kit please do all you can to make sure it’s finished by January’s meeting, and if not, bring along what you do have done. Also for the January meeting, the tree building demonstration will continue. If you haven’t taken part yet, please feel free to join in, as the process will be described from the start, so everyone can catch-up. A little tardy in getting the photos uploaded from last month’s meeting, but here they are. We had a fantastic turnout for #13 Night. The rules were that the subject had to encompass the number 13 in some way, and you guys got really creative: we had aircraft from VF-13, a Zero that’s serial number added up to 13, a 2013 car, and a diorama with a house address of 13 on the tiny mailbox door. Photos are below. 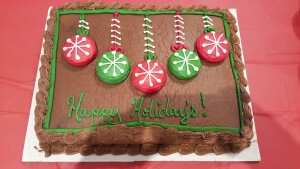 December’s meeting is on the 11th, and we’ll be celebrating the holiday season with our annual party. See everyone there.